For the second and final week of my Multicultural Practicum class on diversity in education, me and a classmate were placed in Heritage Academy of Science and Technology in Minneapolis, Minnesota. A 100% Somali school, this was something completely different than the public school systems I’ve grown up with and taught in. I didn’t know what to expect. This change in culture was huge for me. Even sitting in the back of the classroom, I became more aware of my clothing and hair. My appearance is something I’ve taken for granted and haven’t given much thought, but it’s so interesting that some women spend their days, and their entire lives, covering their bodies. My initial thought was of sadness, but I know that’s not the right perspective. Somali individuals do not see it that way. Their clothing is a part of their culture and I have to respect it, just as they have to respect my curly, long hair or short-sleeved shirt. 2. Students in high-poverty areas can be a challenge. The other teacher was the head of discipline for the school. He had a more effective classroom because he didn’t brush off disruptions and misbehavior. Instead, he addressed it right there and by bringing attention to that student, it made the behavior change. Both teachers also pointed out good behavior, which worked as a positive. Heritage Academy has 18 teachers, and the majority of them are Caucasian. In my opinion, this proves to be a challenge, as the students often have side conversations in their own language, try to do things to impress their peers, or even mock the teachers at times. I’m not saying this wouldn’t happen in any school, I just noticed that there is a commonality among students because they are all of the same culture–sometimes it seemed that they would band together to misbehave. I honestly think that some of the classroom management issues I observed stem from the poverty level of these students. For the majority of them, they have parents that are working full time just to make ends meet. Some students may eat their only meal of the day at school. And quite a few of the students are also struggling with their identities on top of all that! They appear African-American in complexion but are not; they are Muslim, Somali, American, and have varying religious beliefs. These challenges can often cause misbehavior, and what I learned in observing is that I need to see students as people, not just as students. They have lives, often difficult lives, out of the classroom and I need to make sure that I’m considering this when I give assignments, grades, or deal with discipline issues. 3. Social Contracts are a good idea. This poster, or one similar to it, hangs on the wall of every classroom. 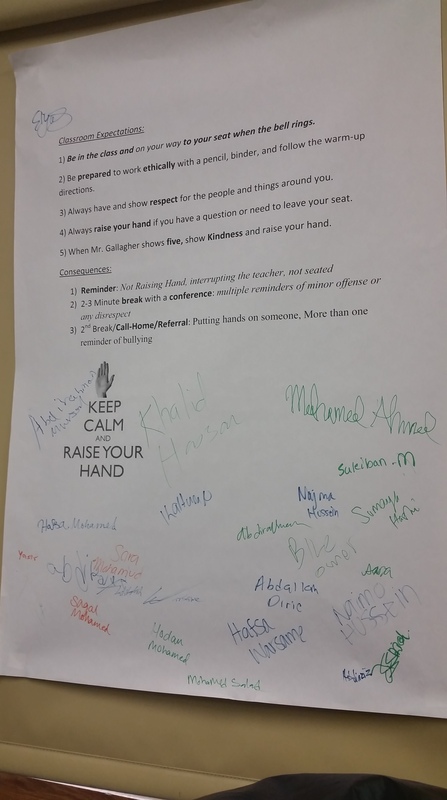 This is a Social Contract, or a list of expectations, signed by each student, that serves as a reminder of the classroom policies. I think this is a great idea, for any classroom, to help students be accountable. 4. Using technology helps to engage with the students and keep some focused while the teacher works individually or in a small-group with others. In observing, I learned about a program called Read 180. This is an online program Heritage bought recently that has great benefits for student reading and comprehension. The program functions as an assessment tool, reading tool, and self-check tool. 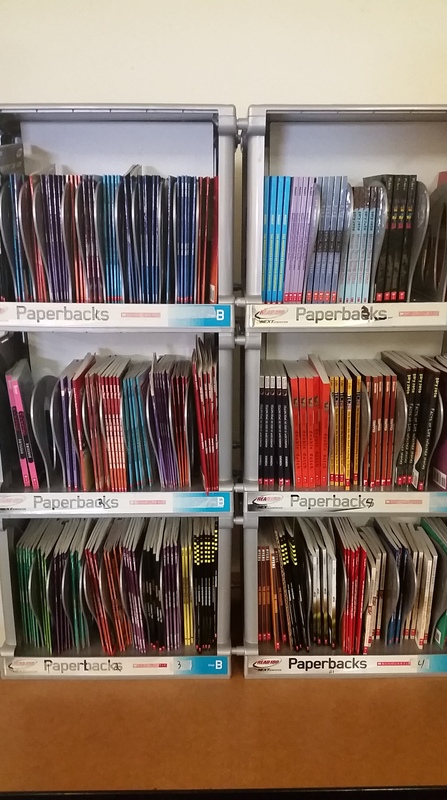 As a part of Scholastic, it has quizzes, skills sections, college and career readiness sections, and reading passages. One of the coolest things I saw students doing were read-alouds. They were given short passages and they were able to use headsets to literally read the passages aloud and get recorded. These recordings were then played back to them and also sent to the teacher, so he could see where each student was at. I thought this was amazing! The best part: the teacher could have some students doing this assessment while he was working with another group of students–a very effective use of time! 5. Audio books for struggling readers–yes! 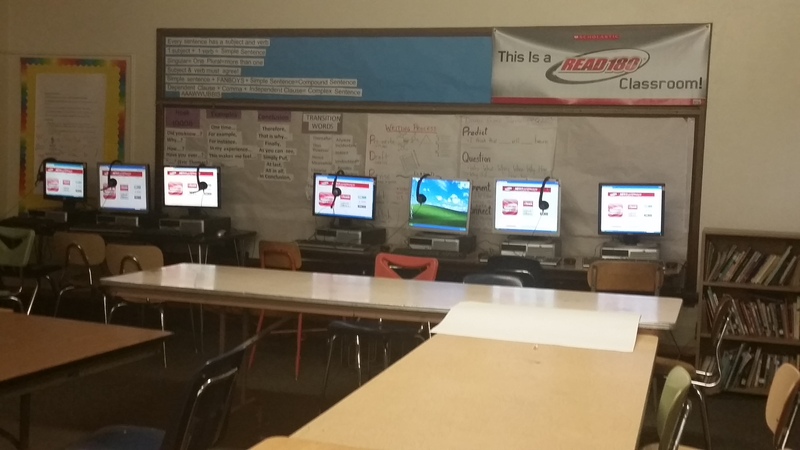 As a part of the Read 180, classrooms are given audio books, complete with headsets. The books vary in difficulty, length, and genre. Students can read by themselves and then complete graphic organizers to show their progress. For individuals struggling with comprehension, this is a wonderful tool because they can follow along and become familiar with the language and how words sound. This also helps them stay on track with the remainder of the class, and students can move at their own pace, too! 6. Sometimes teachers have to make accommodations — and that’s ok! One of the beliefs of the Somali culture is that you cannot draw or represent the Somali god in any way. Somali culture also restricts pictures/visual representations of any kind in any classroom literature. And students are also required to pray daily during the school day. 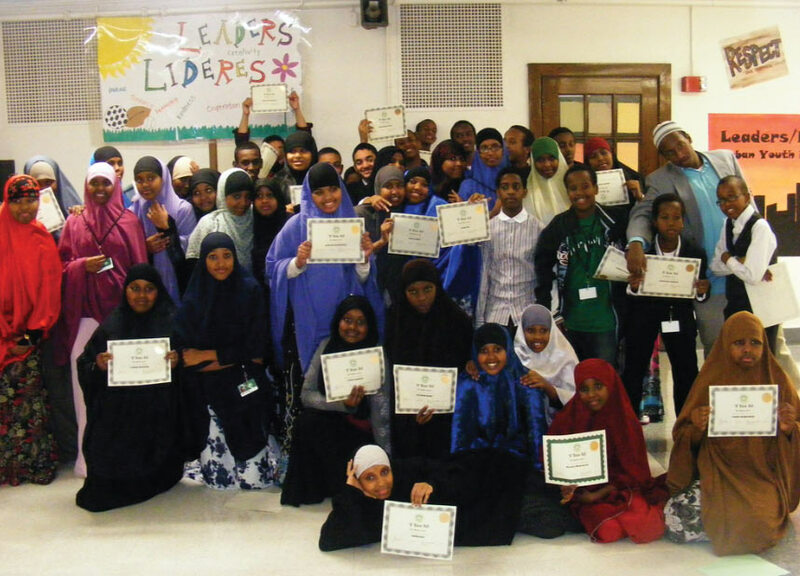 These are just a few of the accommodations that Somali individuals need in their classrooms. They aren’t major, but for someone not used to them, they are very different! Having this clinical experience was so enlightening for me because I learned about the Somali culture and I now know that I must be a tolerant, understanding, and educated teacher. I must also make sure to teach my students about other cultures, and encourage everyone to be accepting of everyone! < Wait…You Don’t Speak English?